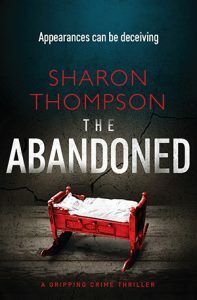 Sharon Thompson is also the author of the critically acclaimed, thriller The Abandoned. The Healer is a dark and suspenseful family drama which will appeal to fans of authors like; Stuart Turton, Tana French and Anthony Horowitz. #1 Amazon Best-seller in Irish crime fiction on Kindle. The Abandoned purchase link here. Please leave a review on Goodreads or Amazon. Thank you. What everyone is saying about The Healer. “…as I read I became young Molly and journey with her as she struggled to find her place in the world and deal with the harsh realities of being different. There were characters that wanted the best for Molly and those that wanted to use her gifts for greed and power. Throughout the book, I felt Molly’s pain, her frustration, her hopelessness, and her never wavering faith that she would find her way home. I don’t like to give spoilers in my reviews but I will say anyone who reads this book will be in for a thrill of a ride as they skirt the dangers Molly has to face and go through the traumas that being different brings her. A powerful story filled with despair, grief, and hope for a better life. 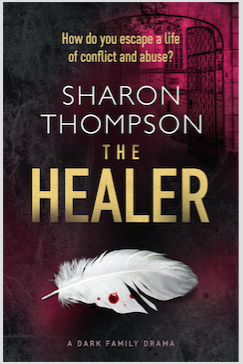 This book is sure to put Ms Thompson back on the bestseller list and will be a much talked about book among my circle of friends and writers.” Amanda Evans. “Sharon really delved deep for this, and magicked up an authentic ‘person’ with a life, a convoluted life. The journey we follow is tragic and also uplifting. I’m happy to report that I just flew through this novel in no time, wishing I didn’t have to sleep but instead could go on all night to devour the saga. Engaging, educating and edifying, and might I add, perfectly proofed which is a big bonus to a pedant like me! Can’t wait for this author’s next offering, but please, can it be very soon?” Avine. “I always know a good book, when I have to tell everyone about it and get excited about the characters.. I do get odd looks sometimes!!! Fabulous, if some what sad at times.. Molly is a beautiful soul who you just wish the best for.. Can’t wait to read more of your books… I used to read to escape.. now I read to learn, indulge, enjoy the ride.. x” Carlene. “I loved this book even more than the first one! This is a dark, powerful story you won’t be able to put down. I was up until 3am reading about Molly’s incredible journey and this one is definitely going on my keeper shelf.” Kaz. Amazon reviewer. “A very well-written and entertaining read. A dark tale for fans of vivid drama.” John and Dianne. Amazon. “This historical drama is centred on the fantastic Molly, telling the tale of a brave and resourceful lady, who battles to overcome violence and exploitation.The aspect I most liked about this novel was the fantastic Molly, one of the most endearing and brave female characters I have read about in quite some time. You can believe in her story and I found myself cheering her along, wanting her to succeed despite the troubles lined up against her. Having a strong female character at the heart of the story made the book for me and its worth buying it just for this character on her own.” Susan Corcoran. Indulgeinwriting.com. Exclusive membership, online writing group.